Deep Ocean Pachislo Progressive Jackpot Slot Guide - Casino Answers! Deep Ocean Pachislo is a 3-reel, 1-line progressive jackpot slot, featuring two wild symbols, multipliers and a progressive jackpot. You can play the Deep Ocean Pachislo classic slot machine at Bovada. Bets on the Deep Ocean Pachislo slot machine are fixed at $0.50. You can play 1 or 2 coins ($0.50 or $1 per spin). To play the Deep Ocean Pachislo progressive slot machine, select your bet with “Bet One” and press the “Spin” button. Alternatively, you can use “Bet Max” to play the 2-coin maximum bet. Casino Answers recommends that you play the maximum bet at all times on Deep Ocean Pachislo. Not only is it the only way to be eligible for the progressive jackpot, but also a couple of the regular payouts are more generous. Being a Japanese-style slot machine, the reels do not stop on their own in Deep Ocean Pachislo. Instead, you will have to press the “Stop” buttons below each reel to bring each reel to a halt manually via the skill stop feature. The Seven and Eight symbols are both wild symbols on Deep Ocean Pachislo. When one of either symbol completes a winning combination, it will act as a 2X multiplier. When two symbols complete a winning combination, they will act as a 4X multiplier. Deep Ocean Pachislo is home to a progressive jackpot. At the time of this writing, the Deep Ocean Pachislo Progressive Jackpot is at $36,355. To win it, you must hit 3 Eight symbols on the payline when making the maximum bet of 2 coins. You can win the Deep Ocean Pachislo Progressive Jackpot by playing at Bovada! There are 11 winning combinations in Deep Ocean Pachislo. The complete payout schedule is as follows (1/2 coin payouts in parenthesis): any 3 symbols (2/4), any combination of 3 Angelfish/Turtle symbols (5/10), 3 Angelfish symbols (10/20), 3 Turtle symbols (20/40), any combination of 3 Mermaid/Dolphin/Squid symbols (20/40), 3 Squid symbols (40/80), 3 Dolphin symbols (100/200), 3 Mermaid symbols (200/500), any combination of 3 Eight and Seven symbols (1000/2000), 3 Seven symbols (2000/5000) and 3 Eight symbols (12,500/jackpot). Deep Ocean Pachislo has superior presentation to most Random Logic 3-reel slot machines. It’s also very unique with its style. You don’t see very many pachislo slots at too many online casinos. Infact, we aren’t aware of any others. Uniqueness aside, it also offers a tremendous progressive jackpot at a low cost. Low risk, high reward is the way we like it here at Casino Answers. So if you are looking to play the Deep Ocean Pachislo slot machine, you can sign up and make a deposit today at Bovada! Are USA players able to play the Deep Ocean Pachislo slot game for real money? 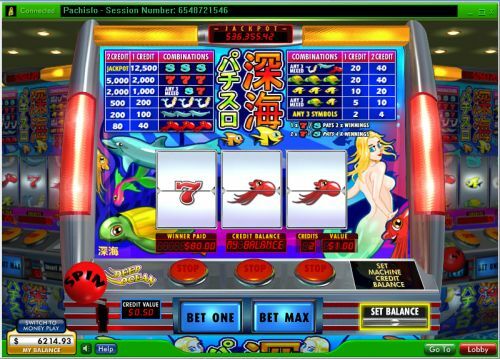 Players from the United States are unable to play the Deep Ocean Pachislo online slot game for real money at this time. For a great selection of USA-friendly slots, please visit Bovada Casino. Pachislo is the Japanese form of a slot machine. A pachislo slot machine is much like a traditional slot machine, except for the fact that players must manually skill stop the reels during a spin.